In 1930, George Leroy Pease of Breckenridge purchased several undeveloped lots on Otter Tail's west end from Nils Peterson who had platted the beach and called it "Pleasant Grove". 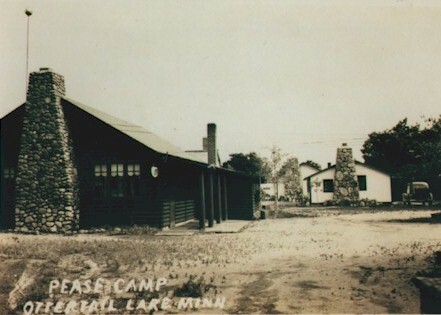 It was here that Pease set out to build his resort called, "Pease Camp". It had 5 cabins, two sleeping rooms and a beautiful lodge headquarters. The original cabins had split log siding with natural varnish finish and stone fireplaces rendering them extremely attractive. In this era, cabins were very rustic affairs compared to what we see today in resorts. Walls were bare and unfinished, with no running water or indoor plumbing. Later Pease added three more privately owned cottages plus a fourth moved in from another lot as their resort prospered. He purchased two large launches which were brought over from Dead Lake one of them originally belonging to the Maytag family. With the death of Pease in 1946, the resort was sold to Jennie and Grant Jensen who, with their son Virgil, had already owned a house next door since 1935. Jensen then continued the expansion by buying the Weggeland store, which he remodeled into a Duplex. In 1949, the Resort was sold to Roy and Laverne Okeson who operated it until 1988 at which time it was sold to Josephine and Jim Spilde. Today, The Resort continues a success with their 14 well maintained cabins. The current owners make it a family affair. Denny & Diane Jones along their daughter Debbie and her husband Paul Ness bought the resort from the Spildes in the fall of 1999. In 2007, Denny and Diane retired, the resort's name was changed to "The Lodge on Otter Tail Lake" and Debbie and Paul and their children took over. They are committed to make it a haven for gamesmen and families alike, into the future.